North Dinwiddie, VA – The 5th Annual Loose Rocker Promotions Colonial Classic kicked off with a gambler’s race on Thursday. In addition to the three $20,000 to win races on Friday, Saturday, and Sunday, racer’s will have the opportunity to win thousands of dollars in prizes and giveaways over the course of the weekend. Thursday’s racing included a Gambler’s race which was won by Brandon Collins. Collins was .011 at the tree and dead-on two for a .013 package in the win. Runner-up Michael Jackson had a great .005 reaction but took .009 at the stripe to break out by one “thou”. The first big check of the weekend was claimed by Greg Showns on Friday night. Showns picked up the $20k check and Loose Rocker Eagle trophy with the win over Jason Hoff. Semi-finalist included Ken Batchelor and Shawn Carpenter. Other action on Friday included the $1,000 Footbrake Allstars race and the $10,000 Legendary 64 Car Shootout. The Footbrake Allstars race was won by Richard Alford Jr. Alford picked up the win over Chris Dixon. Holden Dial picked up the Legendary 64 Shootout win over Brent Martin. Saturday brought clear skies and lots of racing. In the $20k main event, Chad Traylor collected the big check with his win over Terrell Sinkler. The Footbrake Allstars champion was Jamey Horton, Dicky Bodmer was the runner-up. In Footbrake, Devin Dudley took home the trophy over Austin Welch. And to wrap up the Saturday action, Andy Lloyd won the Gambler’s race over a red-lighting Mike Novitsky. 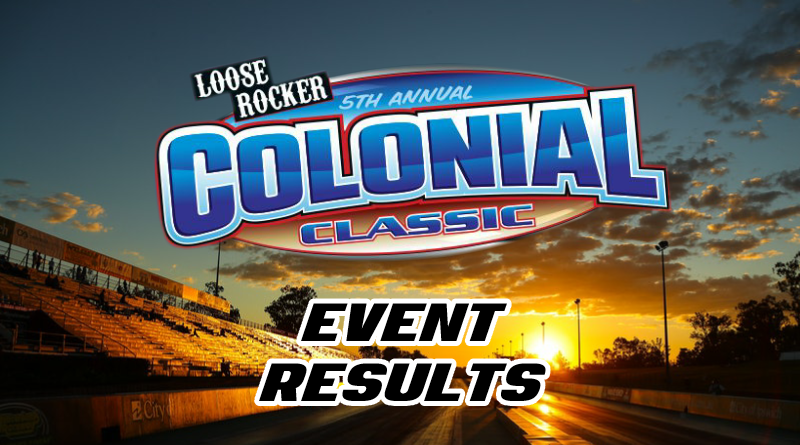 The Loose Rocker crew wrapped up a successful Colonial Classic on Sunday with one more $20k main event. TG Paschal collected the big payday over Ray Fordyce Jr.
Sunday’s Footbrake Allstars winner was Chris Moren over Richard Alford Jr. who reached his second final round of the weekend. And finally, Devin Dudley won his second race in two days. Dudley took home the Footbrake win on Sunday over Rodney Lunsford. The lone semifinalist was none other than race winner Dudley. Congratulations to all the winners at the Colonial Classic.